Another thundery setup is set to move across the state tomorrow with widespread storms. Main areas include the Eyre Peninsula, Mid North and stretching into the Riverland. A broad area of low pressure in the west of the state is producing areas of storm activity with some being severe in the far NW of the state. This system is expected to move across the southern part of the state tomorrow ahead of a cold front which is expected to move in early evening. Ahead NE winds will begin to increase to 35-50km/h before tending N NW later in the day with help of a 90-100km/h LLJ so we may see some decent surface gusts, likely with showers/storms and on the Mount Lofty Ranges. Adelaide has a chance of seeing a rumble or two later in the day but the maps have the times all over the place but any time from Midday onwards. Some of these storms may become severe but likely to be seen across the Mid North, Flinders and EP districts. Storms will continue to contract east as the evening wears on. Would be nice to get a storm to welcome summer but we will see how we go. Yer plenty of thunderstorms around tomorrow, chiefly afternoon. Should get a general band or clusters through Adelaide between 3-6pm but some weaker ones may arrive earlier. Best areas EP and Upper North, good jet dynamics and shear through profiles, won't take much to get em going...and they will be moving. Unfortunately mostly high based with extreme fire danger so lots of CG's combined with the gusty winds will make for bad fire conditions plus raised dust in more rural areas. 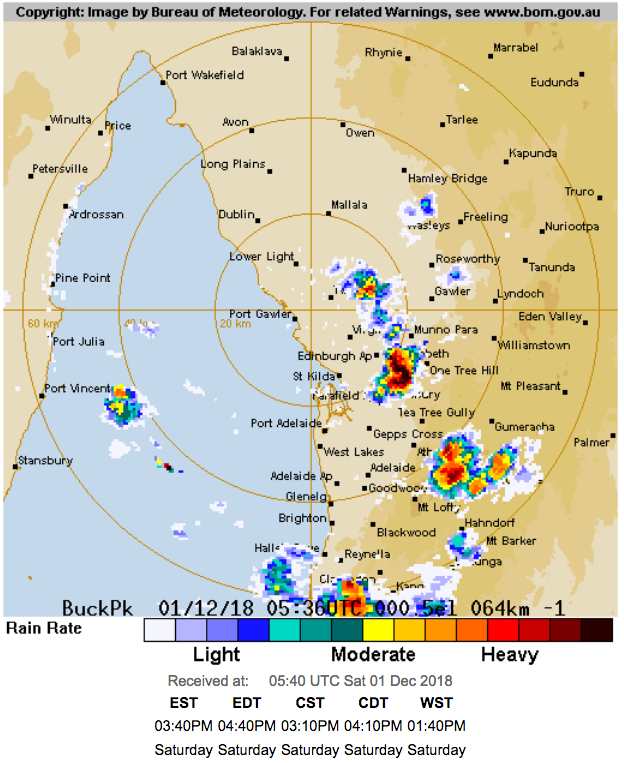 Well...if it's any consolation....just heard distinct thunder to the west, from east of the Onkaparinga River Valley . Had some heavyish rain with embedded corn sized hail, it's now moved on, crashing down towards Mount pleasant. As they're having their Christmas parade shortly,,, it may be a messed up parade. 2 rumbles were loudish enough to shake the house a bit. Thoroughly enjoyed watching those earlier cells crossing the Blyth Plains. Some very nice clear airs hitting the hills and plains and starting fires, then a savage freshy with probably 80km + winds and curtains of very heavy rain and some flangs. It moved so damn quick I timed it wrong and it caught me before I got to the car, ended up very wet. Some nice dust curtains and a few big gustnadoes along the boundary, was a couple of helicopters flying along the dust looking for fires I presume, need to add one to my chase setup I think haha. Very fast and advantageous. Couldn't believe they were riding the edge of the outflow near the gustnadoes, I would have thought wind shear would be problematic. Nasty cells on the radar. mesocyclonic winds, if not a tornado recorded. I punched the same cell and the winds were truly mental can't really fathom a guessz probs 120km at least, 1m visibility, incredibly torrential rain hail somewhere around 3-4cm. The hail roar was unbelievable and lightning was off tap. Best supercell I've ever seen by far. The wall cloud had rapid rotation, can't believe I got out without damage to the car. The mesocyclone was sucking dust out of the paddocks turning it straight into the storm. I hate to say it but this system has been a complete flop so far. It has been a horrible day with strong gusty northerly winds and a very dry atmosphere. No surprise rainfall total for the day 0.0mm . BOM said 80% chance of rain of around 2-5mm. I suppose we are unlucky again but a horrible day all round. Unfortunately this is the nature of the convective beast, most times there is someone that misses out and by is it frustrating. Managed 2 storms this arvo, intercepted the first at Maslins Beach and the second at Port Willunga. Few CG's in them but nothing that special. Nice base structure on arrival, especially the second. Howling N wind made the day pretty ordinary, didn't even get the good camera out of the bag, was all iPhone. Incredible storm that through Snowtown, setup certainly was there for big gusts but 156 is insane....3rd highest in SA history. Yeah, unbelievable stuff really! Didn't mean to punch the storm but glad I did, might not ever see rain rates and wind like that again. Epic stuff. Cold front did the trick, seems to be the key for strong supercells in this area. Wondering what damage has been done to the vines around Clare though, up to around golfballs fell in some parts of the town, lots of tree foliage on the ground. 4 registered (mithrandir, Multiversity, petethemoskeet, Adaminaby Angler), 65 Guests and 3 Spiders online.